Skyrim is set in the northern region of the land of Tamriel, a region called, funnily enough, Skyrim. Dragons, long thought to be either extinct or the stuff of legend, have started appearing. And they’re not happy. Their arrival is believed to be the beginning of the end of the world. So it’s up to you, a former prisoner, to discover your hidden heritage and take the fight to the dragons. There’s a lot of freedom in playing Skyrim. It’s up to you where you’ll travel, what missions you’ll accept, what weapons you’ll be proficient in, who your character will be. There’s so much you can do here that sometimes you’ll be surprised what you end up doing. The passion I’ve brought to picking flowers and blacksmithing is most unexpected. Some of the issues I had with the previous Elder Scrolls game, Oblivion, have been improved here. Things have been simplified without making the game simple. While there are heaps of things for the OCD player to do, it won’t get in the way of the player who just wants to cut zombies in half with a two handed axe. I love playing my high elf/werewolf with a mace in one hand and a magic fire bolt in the other. But I can easily imagine restarting the game and playing someone completely different. Combined with the massive size of the game (I’ve been playing pretty solidly for four weeks and nowhere near finishing) Skyrim is a game that offers a lot of bang for your buck. 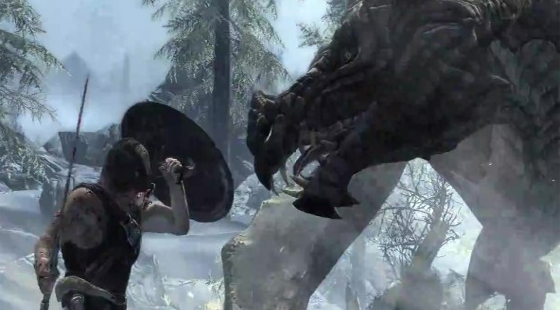 When some games are played out after a couple of weeks, Skyrim offers exceptional value for money. Normally I wait until I finish a game before I review it. I want to see how the game holds together as a whole. To see the message of the game play out as the credits get ready to roll. But with Skyrim, I have no idea how far I am from finishing. And that pleases me. But despite this, there are still themes in the game worth commenting on. I love Skyrim, but there’s one aspect of the game that troubles me. There doesn’t seem to be any sense of morality in the game. I can lie, cheat, steal, kill innocents, bow down to evil demons (called Daedric Princes in the game), and as long as I don’t get caught, there’s no consequences to my actions. I should feel bad for doing evil things. I should feel the weight of making bad decisions. Yet, in Skyrim, this is not the case. It can be done. Fallout, made by the same studio, does a great job of challenging the morality of your actions. That’s something I would like to see in Skyrim. Otherwise the temptation is to do whatever you want without considering if this is a good thing. The land of Skyrim is engaged in civil war. For 200 years there has been no emperor. Different factions with different agendas are all fighting for control of the nation. The coming of the dragons points to certain doom. Surely, in the face of such grim tidings, a unifying figure is needed. A saviour to rally behind. Could you, the player be that saviour? After all, you possess powers that no one else has. You share a bloodline with the great kings of centuries past. You are the Christ figure of Skyrim. It would be easy to make a link between you, the player, and Jesus. And there might be developments later in the game that would strengthen these connections (don’t spoil it for me!) but really, my game character falls short of the glory that is Jesus. Where I have to fight dragons and evil wizards with my sword, Jesus conquers his enemies by dying on the cross. “For Christ died for sins once for all, the righteous for the unrighteous, to bring you to God.” (1 Peter 3:18) If dying in Skyrim was the way to win, I would have conquered the game in five minutes. Jesus is the victor over sin and death because he has true power. He is God himself. I may (eventually) be the saviour of Skyrim, but I’ll never be on the same level as Jesus. For some people, Skyrim is a game to avoid. If video game addiction is something you struggle with, then this game is a dangerous narcotic. It will steal your life if you’re not careful. If violence is something that turns you off, there’s more than a reasonable level of blood and murder ( which is why it gets an MA15+ rating). And if playing a game that involves engaging with fictional gods and demons, including worshipping them, is a deal breaker for you, the Skyrim is a game that you should leave on the shelf. Skyrim means bad things for the gaming industry. Because, as long as I have Skyrim installed on my PC, I can’t see me wanting any other game for a long time. I’m thoroughly engaged with this game. If you’re even remotely curious, give it a shot. Skyrim is pretty incredible. After restarting four times, first as a Nord Barb, then as an Argonian theif twice I’ve settled on an Orc Beserker. The Morality thing is quite modern, and I feel one of the themes of the game is the urkiness of real world morality. Both the Imperials and Stormcloaks both have extreme high and low points to their objectives (although Im tending towards the Imperials at the moment) and a lot of the quests have you making decisions either without the availability of full information, the posibility of deception or a moral greyness. For example, breaking into someones house to uncover evidence against them. Or getting involved in a situation where both parties tell you the other is in the wrong. In a way I like it. It feels real, and its very Viking (Skyrim being based on a sort of Scandinavian archetype, the Nords being a Norsesque people). They were a people who didnt seem to exhibit any sort of conventional morality. I get your point about right and wrong going unpunished; i definately think there should be consequences. But I like the feeling of having to make those ethical decisions myself without a karma bar telling me what to do. I think, in a way it makes me think more about the right or wrongness of my actions. Do I have a right to go around Skyrim, my own brand of justice and truth in the form of a skyforged steel axe? In Fallout, if you ate the flesh of a person you lost Karma, even if the game considered killing them in the first place to be morally correct. This always annoyed me, as it didnt fit with what I considered upright or not. By all means, i beleive in absolute right or wrong. I just think that Bethesda understand that that does not stem from them, and thus they have created a game about grey morality.